Child abuse is devastating the lives of many children in Guacamayal, Colombia. Our care centre exists to bring care, support, protection and love to children affected by abuse and trauma and is transforming the lives of 200 children through counselling, education and family support. In an unprecedented event in Guacamayal, the children and staff of the Emmanuel Care Centre, accompanied by some of our children's parents, went on a walk against child abuse through the streets of Guacamayal. The children and staff at the Emmanuel Care Centre wanted to give their voice of protest and raise awareness in the community of the issue of abuse, in order to awaken the conscience of people in the community to protect children, and to make known to the abusers, that the children are not alone and that there are people united to defend them. 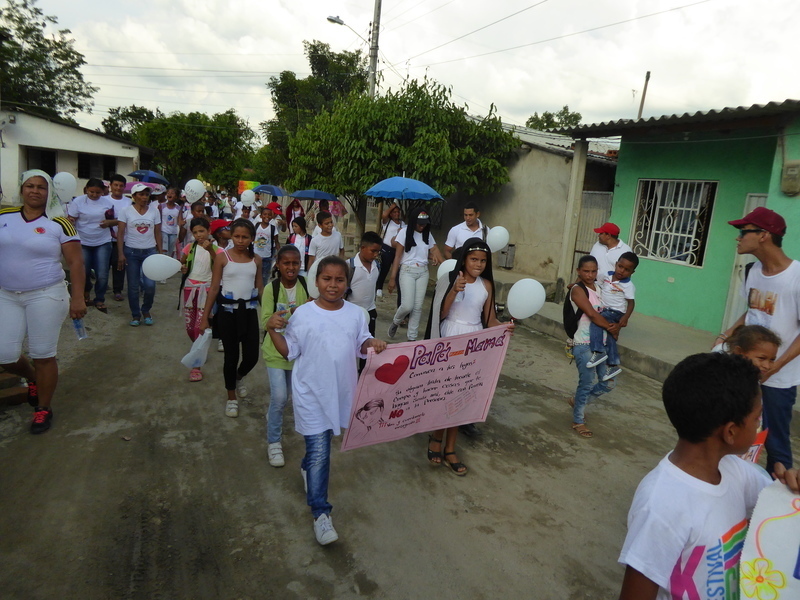 The children and staff dressed in white t-shirts and walked carrying white balloons and posters with messages against abuse. As they walked they declared messages against child abuse aloud. "Emmanuel Care Centre present against child abuse. If your son or daughter decides to speak, encourage him/her and show him/her confidence so that he/she can always speak freely"
The aim of the march was to communicate the message that child abuse is not acceptable and to help parents know how to support their children and encourage them to speak out if they are being abused. The advice given to parents is to learn to listen to their child and to believe what they tell them in regards to abuse. The march encouraged parents to tell their children that if they are harassed, exploited or made to feel uncomfortable by someone, to say no and to tell their parents straight away. The group walked through Guacamayal, arriving at the main square of the town where a group of children performed a drama about child abuse and what steps to take to protect children and report abusers. This location is where most people tend to congregate and where the most trade happens, therefore many onlookers heard the children's voices and messages. The walk was a great success and all the staff were amazed at the bravery, courage and confidence of the children who were motivated to take a stand against child abuse, many of whom have been impacted by abuse directly or in their families. The children's bravery shined brightly in the community and the message they shared was heard loud and clear. Many people were inspired to hear the children speak up and stand against child abuse. The march along with the work of the Emmanuel Care Centre is increasing awareness, protecting children and helping children find freedom from abuse in Guacamayal. The care centre is a safe place where children can know: “You're not alone. Do not be afraid" and with the help of the community, we can break the silence and rescue many more children.